In this post I outline the points of Burridge’s influential argument that the gospels belong to the genre of ancient biography. Richard A. Burridge has been central to the development of wide scholarly agreement that the Gospels are biographies (or technically βιος) with the publication of his doctoral thesis, What Are the Gospels? A Comparison with Graeco-Roman Biography. To analyze their genre he compares the generic features of the gospels with Graeco-Roman biographies. Before posting the details of Burridge’s case, I sum up my own reasons for disagreement. But you’re allowed to skip this section if you want. I have thought that despite the extent of Burridge’s analysis, the βιος genre simply does not describe the gospels, in particular the Gospel of Mark which is my primary interest. What we recognize as ancient Greek and Roman biographies are clearly and directly “about” their subject persons. The Gospel of Mark, unlike Greek and Roman biographies, is not “about” the person or character of it central figure. And I think this applies to the Gospels generally. The acts of Jesus in Mark are not written to show what sort of personality or character he had, but to demonstrate that he came from God and was the Son of God. The words of Jesus are not written to inform us about the personality or character of Jesus, but to instruct readers and convey, directly or indirectly, a gospel message. They are about the identity of Jesus, not his life story. At the end of reading the Mark we know nothing about Jesus as a person. His words and works have only demonstrated that he is a supernatural being who came in the flesh and who is waiting to return again. Furthermore, and of utmost importance, Mark informs readers of different ways of responding to this man from God (not “man of God”), and much of the narrative illustrates different ways various people respond to him, with implied messages for readers to respond with an informed religious faith. In other words, Mark (and the Gospels) are about, well, the “gospel” of Jesus Christ. His life does not inspire us to be “like him” because we never learn what he is like as a personality. Jesus is not someone whose life inspires readers. It is his death that moves readers with compassion and horror, but not inspiration. What moves readers is the knowledge that he is God or the Son of God, and that as such his teachings carry authority. He must be obeyed. His works are conveyed to move readers to have correct faith in Jesus, not to reveal his personality or inform us about his character. Jesus comes across as the vehicle for the teaching of God and as a God figure who is still present with the readers and in whom they must have faith. The gospels, in particular Mark, are about the identity of Jesus and the correct response to him. They are not his biography. The details of the words, actions, narratives are there to establish that identity, or to ensure the correct response to it. They are not there to portray a biography. But before I elaborate on this in another post, it is necessary to at the very least outline the main points of the book that has been most influential in apparently persuading many that the gospels are biographies. Needless to say (again), I disagree with Burridge’s claim here. The words and deeds of Jesus, certainly in the Gospel of Mark, do not display the character of Jesus, but demonstrate his identity. Even Mark presents knowledge of Jesus’ family; Matthew and Luke contain genealogies, and speak of Bethlehem and Nazareth. As regards the quality of characterization in βιοι, we saw a tendency towards the typical and even the stereotypical, but noted that through the actual stories and anecdotes a much more ‘real’ feel for the character could be obtained. The same pertains to the characterization of Jesus in the synoptic gospels. . . . The portraits drawn by the evangelists are well known: Mark’s Jesus is rather enigmatic and secretive, rushing around doing things ‘immediately’, a miracle-worker, yet one who talks about suffering and who eventually dies terribly alone and forsaken. Matthew shows a Jewish Jesus in continuity with Israel, the ‘new Moses’ who delivers his teaching from the Mount and reinterprets the Law. Luke, on the other hand, stresses the ‘man for others’, with his concern for the outcasts and the lost, for Gentiles, women and the poor, who dies with words of forgiveness for his executioners and acceptance of the criminal crucified with him. . . .
Burridge hits the nail on the head in that last paragraph when he turns away from literary analysis and towards millions of believers who believe they “know” Jesus. They know him as they know God, I suggest. And they know him as one who loves them personally now, not as a personality in the past. That personality they believe they ‘know’ is a projection of their own faith and needs, and it latches on to key passages in the Gospels as hooks for this faith and finds something far more than is expressed about the person of Jesus in the past tense in the gospels. We have moved away from literary genre and literary analysis. Best declares that Mark was “not written to provide historical information about Jesus’ even though it does do so.” Lindars says that Luke was interested in telling the story to satisfy the curiosity of the outsiders. If the deaths of eyewitnesses played a part in prompting the writing of the gospels, then this could be a motive. But the belief that Jesus was not dead anyway makes the idea of “preserving his memory” somewhat different from what is normally meant by this. Probably the most common purpose of βιοι in our examples was their use in debate and argument. . . . [Weeden and Bilezikian . . . see] polemic in Mark, directed against the Twelve and traditional Jewish Christianity . . . Luke-Acts may have been used as apologetic for Paul at his trial or, more likely, in the later Jewish/Gentile debate . . .
Noteworthy, I think, that Burridge turns to 1 Peter and a presumed knowledge of Matthew on this epistle’s author’s part to support his argument that the character of Jesus is presented as an examplar. He is certainly correct to quote Shuler saying that the intention of the evangelists was to elicit faith. But is the Gospel of Mark’s Jesus really an examplar? Maybe, but only insofar as the gospel’s message is to give up your life and put on a new identity and life. In that context Jesus is presented as the model of abnegation of one’s life. This is surely veering towards an ‘anti-biography’ in the normal sense of the word. Jesus is identified as the being behind the human, the one from heaven and still in heaven, and he calls readers to “follow him” to that extent. This is a theological or religious rule, not a portrait of a real “human life”, certainly not one of or about a personality. The above are listed by Burridge as the generic features in common to both βιοι and the gospels. Common elements do not necessarily themselves require a common genre. Burridge relies on the wide range of shared generic features, and on finding them used as extensively in the gospels as they are in the βιοι as decisive. Future posts will raise questions about the adequacy of Burridge’s proposal. Posted on 2011-01-17 21:52:15 GMT+0000 by Neil Godfrey. 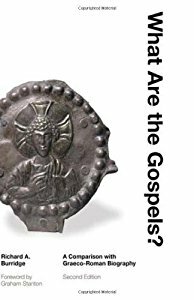 This entry was posted in Biblical Studies and tagged Burridge: What Are the Gospels?, Genre of the Gospels, Gospels, Richard Burridge. Bookmark the permalink. This might be a little off-topic, but I wonder what your thoughts are on J.J. Blunt’s book on undesigned coincidences in the bible? Timothy Mcgrew states:The undesigned coincidences among the gospels provide a cumulative case that at numerous points the authors of the gospels were faithfully and independently reporting actual events rather than merely copying one another or engaging in mythic elaborations. I have never encountered this line of argument for gospel historicity before, and I am curious what a Jesus-mythicist might think of this? …and there is no new thing under the sun. Does anyone besides me hold the opinion that the author of Ecclesiastes was the only mature adult to contribute to the Bible? Certainly no mature adults. It is an unforgivable sin of anyone attempting history to presume ancient people were lesser people than moderns. Tim Widowfield of 3011 will likely think Tim Widowfield 2011 an ignorant fool. Our circumstance cages our intellect and rare is the person who can step out of it. We should be careful about judging our ancestors to harshly. Walter, I have not read the original argument, but I would think that the close correspondence of sentence content, order and narrative structures are very stong evidence of literary copying, so strong that the discrepencies that do exist are compellingly explained within the terms of that textual relationship. Would a teacher marking these three essays be naive enough to accept that no copying had been going on? Where is McGrew’s original argument? Here is an .mp3 of McGrew giving a sermon on the subject. I would love to hear your thoughts on this when you get the chance. I also posted a thread on this over at FRDB. Thanks. While I have not had a chance to critically examine the ‘bios’ category for the Gospel’s I think you are in good company with disagreeing, especially, regarding Mark. I just finished reading Mark’s Jesus by Elizabeth Malbon and I think she may agree with you that Mark’s Gospel is not about Jesus. It seems, for her, that the Mark’s Gospel is about God and his in-breaking Kingdom. Jesus is the main vehicle through which the defeat of Satan starts but that is not enough to make it ‘about’ him. Some years back I wrote about the fictitious character of Mark’s gospel and have posted it at http://vridar.info/xorigins/Markparable.htm The relevant section is headed ‘Characterization in Mark’. One of the first clues that we are into a tale where the figures are symbolic and that this is not a biography of Jesus is the description of the clothes and diet and place of abode of John the Baptist but silence on such naturally biographical type matter with the main character. That is proclaiming from the get-go that any details that a reader might normally think of a “biographical” are not, and that they are rather symbolic. Thanks for the link. As this constitutes a frequent argument here, I’ll look over it in detail, and will try to comment in detail, perhaps on my own page( for convenience, unlike some I’m not out to self promote here!I’ll send you a link if you care to look it over). It is a thorough statement and deserves more space than I would feel comfortable using here, I already hog up to much space! I do request the names of any ancient works that you think might be similar parableic(? )works, for comparison. It would be useful to make a list of features in a typical βιος that are missing from the gospels. If we understand why those features are missing it may also help explain why the gospels are not biographies. One missing element that comes to mind is physical aspect and how it relates to moral character. Recall Suetonius’s description of Julius Caesar’s penchant for wearing laurel wreaths so he could secure hair over his bald patch. His vanity is an indicator of his personality and a window into his moral character. And who can forget Plutarch’s thumbnail sketch of Alexander’s appearance — “the inclination of his head a little on one side towards his left shoulder, and his melting eye…”? To the four evangelists, Jesus’ physical appearance has no importance whatsoever. Human appearance? Human virtue? Pointless. As you pointed out, the crux of the matter is not Jesus’ character, but his identity. The reason Mark tells us about miracles is not to prove Jesus’ virtue, but to prove who he was. If we already know they’re not a biography why do we need to check and see if it is missing the features of a biography? What we are doing, and I am indebted to Christopher Bryan here, is looking for a dominant cluster of of motifs that are common to a genre, and sometimes a work may be difficult to classify. Is the Yule Brenner film “West World” a science fiction movie or western? Compare Suetonius’s “on the Life of the Caesars” with the anonymous “Life of Secundus the Philosopher”, and you will find little in common, but both were generally held to be Lives, and that is probably the most important standard. People of the age that a work was written for know better than we what constitutes a particular genre. Since none of us here are classicist, our opinion on Greek genres is as reliable as our opinions on genres of hip-hop. Of course we can and should address the arguments of others. Burridge uses the method of identifying “a dominant cluser of motifs that are common ot a genre” and came up with the Gospels being biography. No, the meaning of a narrative is not always found in technical features of a literary work. Burridge demonstrates the inadequacy of using “dominant clusters common to a genre” as a means of identifying a genre. The identification of a genre is made at a more psychological/cultural level than the objectively measurable textual features. The genre should be identifiable by objective clues. If someone ask you why you think “The Three Stooges” is comody, while it seems that it is something we know instinctivly, you should be able to explain what features made it a comedy, banana cream pie fights, cosequenceless violence, absurd situations. You might have to explain what the psychological/cultural level is. Is this simply asking what someone from the culture that made the work thinks it is? Burridge seems to suffer from parallelomania. My own take so far, is that the Gospels are rather odd works, but perhaps they would not seem so odd if we knew more about the period. You are right that the subject is, as Mark puts it, the beginning of the “Good News”, which is something to the effect of Jesus is Christ, Christ is the Son of God, and he has risen to sit at the right hand of God. Thus the “young man” of Mark 16:6 concludes the beginning of the Good news, with his statement that Jesus is risen. Since the Gospel is dependent on the act of Jesus, he is the dominant person of the book. While Matthew and Luke try to fit the story Mark presents into a more traditional Life, I don’t think Mark would find any of the pre-baptism legends of activities of Jesus relevant to his story, and if Jesus had lived for another 30 years on Earth after his resurrection, I don’t think he would find it relevant for his book. Weighing heavily on the look of mark, is Mark’s familiarity with Jewish literature. We might assume Mark read Homer, he may have known Xenophon or Plato, but he certainly has read the old testament. The presentation of Jesus is rather like that of figures from the OT. While Secundus also skips a lengthy intro to get into the story, that is also a common hallmark of the stories of Judges and Kings. The character is tied to the events for which he is famous. That Jesus “Life” ends at his death, is not so much the product of the presentational form of a biography, but that it is his death that Jesus is famous for. It isn’t impossible that the author would be interested in the death of Jesus, even if the gospel had been established some other way, but i think your right Neil, the Biography of Jesus isn’t the author’s priority, we only get a year of his life, and background details are provided as elements in the current story line, like his relatives when they come to receive him, we find out he is presumably from Nazareth, since the the demons call him Jesus of Nazareth, he insulted by being called a “carpenter”. I would argue that it seems the narrative reveals a lot about Jesus personality and character, so we don’t need to have Mark stop and tell us Jesus was a compassionate man prone to angry flare ups and enjoyed low company. I think Mark would think a description of Jesus physically a waste of ink. Physical descriptions are not a hallmark of NT literature(or Hebrew literature, physical descriptions are only mentioned as the plot needs them; I.e. a beautiful maiden, a cripple,), be it Jesus, Peter, Pilate or Paul. Well enough for now, i’ll save some for later. Great stuff Neil. Saves us from having to read it. If Borridge had actually taken the time the learn the meaning of Bios = life, he would have known from the start that “Mark” (the only one that really matters) is not at all about the life of Jesus. It’s about a specific MISSION (Greek Tragedy). Borridge is in the familiar position of citing as evidence things which are not known to exist, “oral and written sources, including notes, collections and in some cases another gospel” and failing to note sources which have been demonstrated to have been used such as The Jewish Bible, Paul, Josephus and Imagination, which were used FIGURATIVELY. Surprised that Bor (Burridge) did not also cite as parallels that the Gospels have beginnings, middles and endings and just like Bios, are in written form. Bor’s criteria here go beyond mere dishonesty to being evil and wicked and even JP Holding, James McGrath and the guy who sold me my used car would be ashamed of them. Yes, well I don’t want to give “being evil and wicked” a bad name, so I’ll be content to allow that his conclusion has had happy consequences for the faith. No Lives of Hillel or Eliezer were ever compiled. Only with respect to Jesus were the various individual pieces assembled to form a portrait in their own right — a fact of theological and Christological importance. In concentrating the readers’ attention upon the person of Jesus through writing a biography, the early Christian gospel writers were asserting something which was never said of a rabbi — that he was centre stage as the embodiment, or even replacement of Torah, a unique individual revealing God in his deeds and words, life, death and resurrection. So a church Dean can even find a way to turn literary studies into a torch for his faith. Curiously, despite the said doctoral student last month demanding that my name not appear in her mail box again and declaring she would not read my blog again (“in six months”), it appears she has resubscribed to this blog only recently. Perhaps it was a technical glitch. Wrestling With Greco Tragedy. Reversal From Behind. Is “Mark” Greek Tragedy? I Am taking a brief excursion to examine in more excruciating detail than “Mark’s” Jesus’ supposed crucifixion, Burridge’s look at the key criterion of SOURCE. Amazingly, [disgust]Burridge takes source as a parallel to Greco-Roman Biography because the Gospels use and edit sources. [/disgust] What Burridge should be looking at though is identification of sources. At FRDB I Am identifying sources in the sample Burridge uses to compare to the Gospels. I have faith that all/almost all the samples make clear what their sources are and, that they are based on historical witness (compare to “Mark” which never identifies sources and has an anti-historical witness attitude). As the primary purpose of biography/Greco-Roman biography is to persuade history and is largely a reaction to perceived myth/fiction on the subject, I think the failure of “Mark” on this critical criterion may put it out of the Bios genre all by itself. Ironically, acquiring a label of Greek Tragedy may be the only Way to save “Mark” as having some historical evidential value based on genre. And the authors make these purposes explicitly clear. The gospels express nothing like these sorts of intentions or values that characterize ancient biography. that all of these CLAIM sources of direct evidence and IDENTIFY the sources. The potential value of GRB as historical evidence is primarily its Sources. Identity of sources is the most important criteria for the historical value of GRB. Clearly “Mark” here has no parallel to the sample. No claim of or identifying of sources. Burridge fails to note this, the most important potential criteria and instead ends concluding that Source is actually a parallel because “Mark” had and used sources. Of course this impeaches Burridge’s credibility, but that is a secondary issue. Again though, I’m just looking at Burridge’s own sample here for starters. When you expand beyond his sample so that the parallels are worse to modern Biography, I have faith that the claims and identifying of source for GRB will deteriorate. Looking forward, another important criteria will be the extent of IMPOSSIBLE claims (which parallel, “Mark” will fail tragically). Another will be Style and another will be Connected narrative. The whole purpose of considering genre is to evaluate the historical evidence of the genre. So the underlying criteria should emphasize rightly dividing Historical Markers from Fictional ones. Apologists play a game here of first squeezing the standards for control of sources to try and fit the Gospels into the category of GRB, which had much looser controls here than modern Biography and than blowing up the genre of GRB as quality historical evidence because it was the ancient version of Biography. Homily don’t play that game. The standard for criteria here, as always, is modern. To the extant something classified as GRB is more about describing character by going beyond history, than to that extent it is not evidence for history. Clearly and explicitly identify their SOURCES and typically imply many other logical sources. They also tend to PLACE the author in position to have quality sources. All are in the 1st person. Compare to “Mark” which not only has none of this but has all the Marks of anti-historical source = figurative use of sources (Jewish Bible, Paul, Josephus), emphasis on revelation and discrediting of supposed historical witness). Amazingly, Bui has no mention of this criteria in his book, even in the section showing supposed critiques of his work. This criteria is the most important one for any type of biography. The related source problem is we know that “Matthew”/”Luke” used “Mark” as a base. You can not pretend that this has no effect on the criteria like Bui does. On the other side his champion for parallel is his conclusion that GRB is more character than historical in context. In the sample though this is clearly not the case. All but Demonax are mostly straight-forward history. Demonax is mostly illustrating character but it is mostly done through supposed historical narrative and not editorial comment. Therefore, it is primarily historical. Most of the historical though is about character. Burridge could really use some proper book reviews. “The underlying motivation for genre in the context of Polemics is usually evaluating to what extent the genre itself is historical evidence for the writing. A genre of GRB, though not as good as modern Biography due to weakness of controls, is considered better general historical evidence than other genre. Since the primary significance of GRB here is its weight as historical evidence and that weight is determined primarily by evaluation of sources, sources would be the very best general criterion to use in comparing “Mark” with GRB. Richard Burridge (RB) identifies Source as a criterion and claims a match because he says that GRB and the Gospels both select and edit sources. He is unable though to identify a single source used by “Mark” which he confesses is the source for “Matthew” and “Luke”. The main source he than identifies for “Matthew” and “Luke” is “Mark”. This is after identifying a large amount of specific sources for his GRB sample. Rather than being a match here, this than is a significant difference between GRB (at least RB’s sample) and the Gospels. With GRB it is easy to identify known sources. With the Gospels it is very hard, or to the extent it can be done, RB has not done it. Tacitus was Agricola’s son-in-law. First hand witness identification. The best. 1 – A preserved speech. First hand. 2 – Report of Munatius. Second hand. 3 – Report of Thrasea. Third hand. 1 – More First hand witness than all the others here combined. Lucian was a student of Demonax. First -hand. 1 – Letters and will – First-hand. 3 – Maximus of Aegae and Moeragenes – some-hand. Note Brown’s identification of “anonymous” at the start. RB’s parallels are generally criteria of FORM and not significant to potential historical witness. Thanks Joseph. One of my first blog posts suggested something very similar but in less detail: http://vridar.wordpress.com/2007/04/22/comparing-the-sources-for-alexander-and-jesus/ It is nice to see Brown also addresses the anonymity of the gospels which was one of my other points in that post. What is significant about the reference to sources — and a self-identification of an author (which is another level of a source reference) — is the manner in which they are used or referenced. It is this manner of the way sources are introduced into the text that conveys an authorial intent or motivation behind the text as a whole. Neil, what’s most important in the context of potential historical evidence is what the author KNEW and not what they thought. So identification of Sources is an order of witness more important to potential historical evidence value than identification of genre. An author who knows history can go either way with it. Genres are potential historical evidence compared to each other. RB’s book is an unintentional case study of the potential weakness of genre by itself as evidence of history. Everyone would agree that “Matthew”/”Luke” are closer to GRB than “Mark”. They have births, long-term sayings, credited witnesses and successful ending. Everyone would also agree that “Mark” has the larger element of GT. Yet “Mark” is not just the primary source for “Matthew”/”Luke”, it is the base. Even worse is that while “Mark” discredits historical witness, “Matthew”/”Luke” still rely on it even though they credit historical witness. The unavoidable conclusion is they had no historical witness available (more evidence for late dating). Here than, even if you somehow determined that “Matthew”/”Luke” have a GRB genre, it has little value as general historical evidence since we do not have to guess at their primary source. We know it was “Mark”. This issue, the effect of the Relationship of the Gospels to each other on their value as historical evidence, is largely ignored by RB. I’ve already indicated that a proper Source criterion shows that “Mark” does not parallel GRB as to identifying historical sources. It also goes the other Way. “Mark” parallels to known sources used fictitiously (Paul, The Jewish Bible and Josephus) while GRB does not. We can identify “Mark’s” sources as fiction and there is no known historical source of “Mark” that has been identified. RB claims that the Gospels parallel GRB because they use and edit sources and says these sources are historical witness. But I’ve just shown for “Mark” that it is the exact opposite. The only known sources are fiction. what’s most important in the context of potential historical evidence is what the author KNEW and not what they thought. If I am not misunderstanding you, I perhaps should point out that my argument was not about what the authors “thought” but what was their intention. (I’m speaking of the real auuthors, not the implied or narrative-voice authors.) There can be overlapping formal points of similarity in works of quite different genres. Thus Lucian’s “True History” belongs to the genre of satire despite its use of the formal features found in the works it is lampooning. I certainly agree with the significance of the identification of sources in ancient historical works. But it is also true that for many of the details narrated in ancient histories we do not know their sources. It is also true that historical writing can include some “fictitious” information that the author probably believes is factual. The point is that even without knowing the source of particular narratives, or even if particular narratives turn out to be nonhistorical, the work in which they appear can still be taken as a work of history. Modern readers just need to exercise cautious judgement when reading it. The significance of the identification of sources lies in what it indicates about the intention of the author. He wants to be taken seriously as a conveyer of authoritative information. We don’t always know if the sources themselves contain much fictitious content mixed with their historical information, if they are self-serving distortions of events, etc. As you say, the sources of the gospel narratives are clearly evident. They are literature such as found in the Elijah-Elisha cycle, the Genesis narrative of Joseph, the prophets of Malachi, Zechariah and Isaiah, Daniel and Psalms, etc. Vines attempts to show that the thematic bonds threading their parts into a whole are souced from Jewish novels. 1) Burridge never clearly states whether he is writing as an Advocate for a genre of Bios or as a Judge. 2) He spends a lot of time going over the history of the issue of Gospel genre and reactions to his assertion of Bios but his review is superficial. 3) He deserves credit for developing a methodology and related criteria which is more than most of his predecessors had. 4) His criteria is based on selecting from previous criteria. The selection is seriously flawed as they are all positive criteria identified to consider possible matches to Bios. No effort is spent on possible Negative criteria to consider possible matches to other genre. 5) There should be objectives for criteria determination based on trying to distinguish among genre and considering the motivation for the study in the first place, the potential historical evidence value. 6) He determines a sample to compare the Gospels to based on criteria for identification of Bios. His sample consists of 5 contemporary (to the Gospels) clear examples of Bios. This is the best part of his methodology. The problem here though is that the sample is too small to be conclusive. 7) While making some effort to compare individual Gospels to the sample his conclusions are always based on the Synoptic Gospels in total. Thus he avoids concluding separately on “Mark” which is the farthest from the sample by far and the most important for purposes of the study. No discussion of the significance of “Mark”, much farther from matching to Bios, being the base for the other two. 8) He often claims matches in total and specifically for “Mark” when there are not any and this is the biggest problem with his book. 9) He concludes that the Gospels are Bios, but his own criteria, properly analyzed, shows that most of them do not match. Related to this he makes no effort to weigh criteria relative to each other and when you do, the matching to the sample is more likely to be form (quantitative) and not substance (qualitative). Really, it looks to me like his Methodology was Bauckwards. He selected criteria based on their matching (in his mind) to the Gospels. The scope of the Methodology is too small to be a study and could only be an inquiry. His inquiry suggests that “Mark” is not Bios which opens the door for it being some other genre. I’m going to compare “Mark” with “Life of Julius Caesar” and “Oedipus” using Burridge’s criteria to see which parallels better. The term ‘genre’ applied to literature, art and film has to do with common elements, not the superficial ones, but those embedded in the work. In literature, a genre constitutes a text. Thus if a work has more than one genre, then it has more than one text. “The Flavian Jewish War: A Senecan Tragedy” (Kindle@Amazon.com 2010) explains how the work of Flavius Josephus is a classical history in the foreground and a five-act Senecan tragedy in the background. The signficant issue is this. If a text through its genre enables an author to express his intended meaning, then which of the two meanings of Josephus is the preferred one. The theory of Roman irony developed by Quintilian points to the hidden meaning in the background text as the preferred one. Thus Josephus can praise as heroes his Flavian benefactors in the history, he can criticise them as villains in the background of five-act tragedy. Now to touch upon Burridge’s claim that the Synoptic Gospels are biography is incomplete. He has not taken account of all the characteristics of biography, particularly of Sacred Biography. The Synoptic Gospels are presenting Jesus as Messiah on a mission to redeem humanity through his death and resurrection. The character of Jesus is not relevant while his mission is. Burridge has made a start, but his task is unfinished. The Synoptic Gospels as demonstrated in “The Four Fabulists: The Literary Genres of the Gospels and Acts of Apostles” (CreateSpace@Amazon.com, 2010), have a second genre. They are classical histories too. Mark follows Livi’s “Ab Urbe Condita”, Matthew imitates “The Roman History” of Dionysius of Halicarnassus, Luke follows the first part of the “The Jewish War” of Flavius Josephus for the Gospel and the second part of “The Jewish War” for the Acts. John closely imitates the “Historia” of Herodotus for the fourth Gospel. Luke, like Josephus in “The Jewish War”, also has a third genre in his Gospel, that of five-act Senecan tragedy. There is more. Look up the study, “The Divine Christ: Christian Myths, Mysteries and Magic” (Kindle@Amazon.com 2012). It demonstrates in detail how Mark begins the public life of Jesus and his passion as two separate monomyths, the genre idenfied by Joseph Campbell in his “The Hero with Thousand Faces”. What Mark begins, Matthew continues to enhance with more details and finally Luke completes the monomyth with its three movements and seventeen phases. Further, the same study points out that Matthew and Luke once again work in tandem and extend the monomyth to the Nativity Narratives as if they were one unified whole. Now the question is of the three genres in Mark, three in Matthew and four in Luke, which of them carries the preferred authorial meaning. Using the theory of Roman irony, it must be the remotest genre, the monomyth. For the Synoptics, therefore, Jesus of Narareth as a historical figure is irrelevant. They prefer rather, Jesus the Christ, the mythcal hero. Does this have theological consequences? You bet. The idea that Mark’s gospel has little to say about Jesus character reflects a poor reading of the gospel itself. It is common currency among commentators that Jesus is presented as faithful and obedient to his calling; this in direct contrast to disciples, who are presented as failing at every turn. In a possible hostile environment, it raises the question to Christian listeners/readers, who will they imitate, the disciples of their exemplary leader?